After several requests and the realization that I have not posted much about the students here at the American Home; here goes. At any one time the American Home has somewhere between 350 and 400 students. Usually, each teacher has four classes that average between 11-13 students each. These classes meet twice a week for an hour-and-a-half; either on Monday and Thursday or Tuesday and Friday. Wednesday is set aside for office-hours, a teachers' meeting, and lesson planning. For some, Wednesdays also include conversation classess that focus more on speaking skills and are open to both current students and others who want to keep up those speaking skills. Nearly every Saturday we show a movie in the afternoon. This is sometimes accompanied by events such as a presentation on a topic of a teacher's choice or an activity like American Football. Each day of instruction has three hour-and-a-half periods and usually a teacher teaches two of them. I usually arrive around 10 and spend some time reading the news are such. On Tuesday and Friday I have an hour-and-a-half of Russian lesson. The rest of the day is taken up with preparing, making copies, drinking tea, and making the occasional foray into the back yard to toss around a football with Joanna, Eric, and Sara. On Monday and Thursday I have the 4:00 period off followed by a BI (fifth-level) class and then an AI (third-level) class that finishes up at 9:00. On Tuesday and Friday I have two AI classes and then the final period off. Each of my classes has a different character. My BI class is a mix of adults and students: the youngest is about 15 and the oldest is probably in her early 40s. They are very talkative and enthusiastic, but somtimes I have a hard time keeping them focused and speaking in English. My three AI classes are also very different. The first has the same sort of mix of students and adults. They are a good class and often ask questions and beg for more explanation. My second class is all teenagers. At first they didn't like to talk very much and I felt like getting them involved was like pulling teeth. I dubbed them my "Silent-as-Death Class," an appelation I stole at Joanna's suggestion from a class last year. The bright spot in that class are the three or four students who sit in the front of the class, who would answer every question if I let them. As much as I complained about them, I think they are coming around. My final AI is the opposite; they are all college students or adults. They are a great class and after some of the struggles with my other classes, I joke and say that this one restores my faith in humanity. That is the character of my classes, but the students vary quite a bit. However, there are two basic types: the young un's and the adults. The youngest students are usually here because their parents want them to learn English. Some of them enjoy it, some don't. They all study English in regular Russian school, but that has limitations. The Russian schools drill grammar into their heads very well...imagine learning "I am, you are, he is..." the way you learned 3+4=7, 3+5=8, etc. The thing they lack is speaking and listening practice. 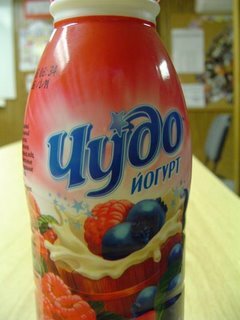 We have examples of students who can read and write passably but say things like "I from in Vladimir." The fact that the young students have learned all of this recently is their major advantage over the older students. Most of the older students studied English at some point years ago is school, but haven't used it in a while. The major advantage that they have over the younger students is that they are the ones paying for this and the really want to be here. I guess all told it balances out between young and old in the end. Last night was the opening of the local philharmonic season. Several weeks ago Galya asked us if we were interested, so several of us jumped on some tickets that cost about $7. Unfortunately Nicole and Molly could not go because of obligations to teach conversation classes, but Bob, Amanda, Sara, Joanna, and I ventured into the world of the arts for a couple of hours last night. 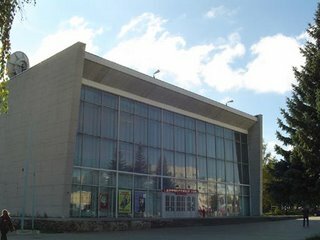 The preformance was by an orchestra from Moscow which was very good but was way too large for the concert hall, which was less than half the size of the MAC (for those of you familiar with IU.) We were into the third piece and a piano started playing: I didn't even know there was a piano, it was so far off-stage. The music was really good. There was no program in sight, so we had to depend on the recitations of some Russian woman on stage who was difficult to understand, so this is the Cliff's Notes version. It started out with a short piece by a composor whose name we did not catch, but who was probably a Romantic. Then there a violin concerto by Saint-Saens. It was enjoyable and the soloist was really pretty good. Then followed a piece adapted from the opera Carmen which featured the same solist and then a break. After the break came Shostakovich's Fifth Symphony, which he composed in 1937 and was first performed in that year. 1937 was the height of the Great Terror and Shostakovich himself had been denounced and was in danger of falling victim. I gathered from the introduction that Shostakovich is a popular attraction this year, as this is the 100th anniversary of his birth. (You can only imagine how much Russians love anniversaries...of anything.) In fact, his 100th birthday would have been on Monday. If you want to learn about Shostakovich and his works, check him out on Wikipedia, here . He is one of my favorite 20th century composors and is not all that well known in America. So, after our visit to "get cultured," we are back to the real world today. Class, class, preparing for class...you get the idea. 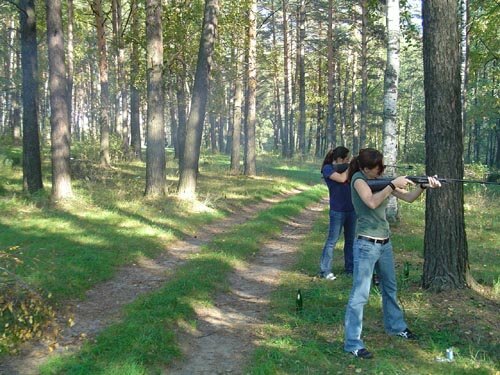 Yup, you got it, you know know your very first Russian word: picnic. On Saunday, after my excursion around the city Eric, Molly, Joanna, and I met up at the American Home to take a little trip to the woods for a picnic. 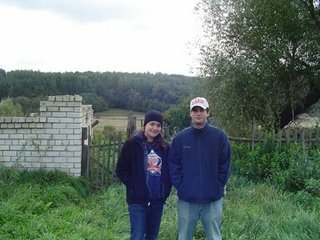 Konstantine, one of Joanna's friends and former students drove us about ten miles to a small woods with a little lake. We had to share the place with other people who had the same idea and some old men who were fishing. We had a fire, some shashlik, and some other snack foods. Konstantine had a couple of air rifles so we spent some time shooting cans of the Russian equivalent of Diet Pepsi at ranges of no more than ten or fifteen yards. We also tossed around the football and went swimming in the lake. It was pretty clear but really cold! 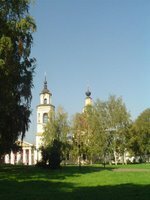 On Sunday I decided to take adventage of the beautiful fall day and sunny skies to wander the center of Vladimir for an hour or so and take some pictures. 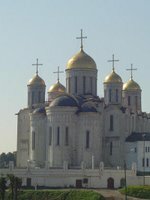 Here are some pictures of a church I found on my walk. I had seen the spires before from the bus and so on and decided to go investigate. I don't know what it is called but it was really beautiful in the full sunlight. This is St. Demetrius Cathedral. 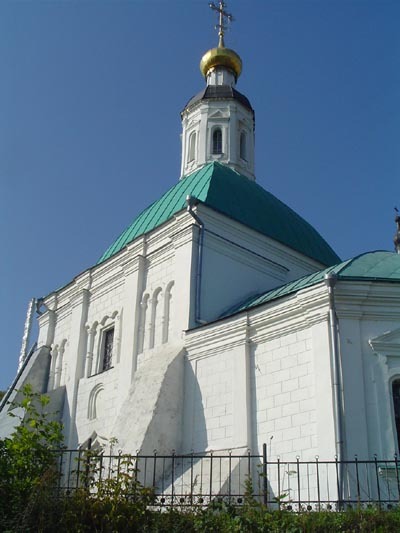 It once stood inside the city's Kremlin and was the personal church of Grand Prince Vsevolod "the Big-nest." (He apparently had an exceptionally large family, but mainly I just wanted to type "Big-nest.") It has a whole bunch of rather odd carvings in the white limestone; mainly a series of mythical Greek and Old Testament heros and prophets, something that is almost unheard of in the Orthodox tradition. This is the Uspensky (Assumption) Cathedral. 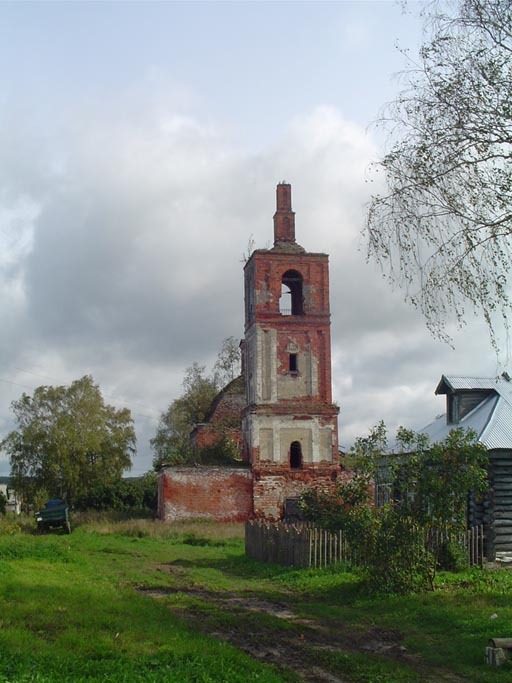 It was originally built in the middle 12th century. 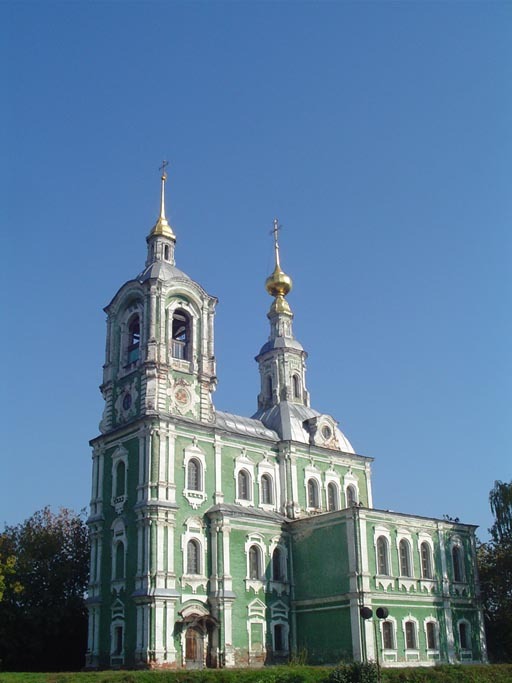 It was rebuilt and enlarged at the end of that century after fire damaged the existing structure. 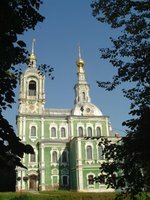 For about three hundred years it was the catherdral where the Grand Princes (the predecessors to the Tsars) were crowned. Think of it as the Russian equivalent of Westminster Abbey. 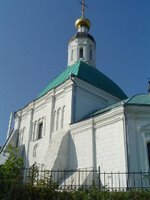 It also served as the model for the Uspensky Cathedral that stands inside the Kremlin in Moscow and was the coronation site of the Tsars. 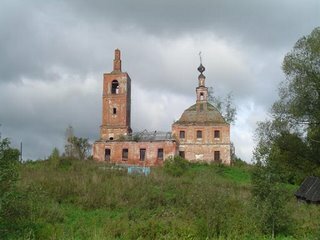 These last two of are separate churches around the center. 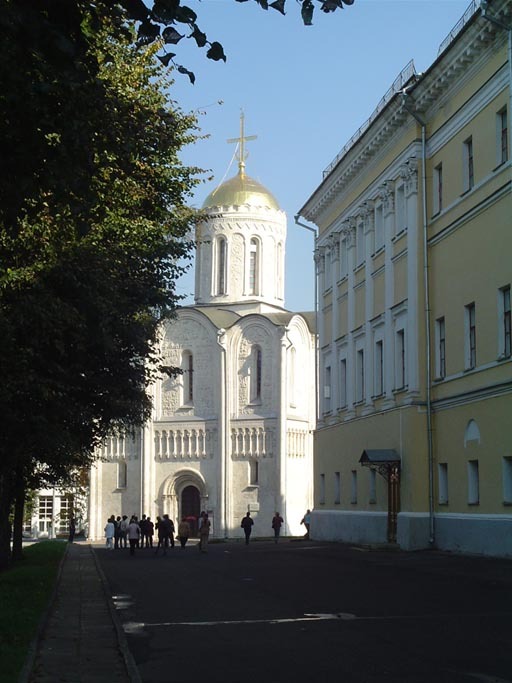 The one on the left dates from around the middle 18th century and stands outside a monastary on Bolshaya Moscovskaya, the main street of the city. The other is quite a bit older but in better shape, and stands on a little back street about a hundred yards to the east of the American Home. This last one is close to the American Home behind the last church. 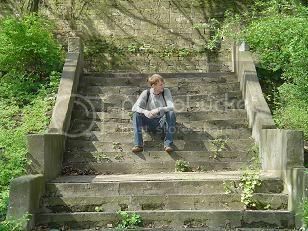 It is a little terrace going down the bluff toward the river. 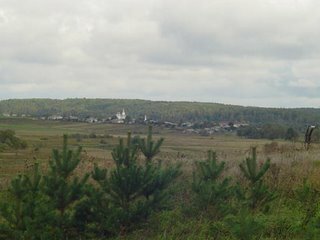 Somewhere down there at the bottom are some houses, the railroad tracks, and the Klyazma River. So, today being a beautiful fall day and a Saturday to boot, we promoted a little thing we like to call "Learn to play American football." 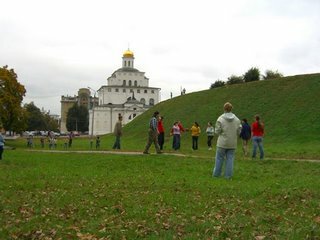 This is Russia and most Russians have never seen a football, much less understand anything about the game. Think of it as similar to the way the average American looks at cricket...yeah, it is that strange to them. But, in the interest of cultural connections we attempted to (I would say succeeded in) teaching some of our willing students to play football. We had over twenty students turn up. Joanna, Eric, Molly, and I were semi-in charge and Bob later joined in. Most of the students who showed up were girls, but that is not too surprising since the majority of our students are girls and women. 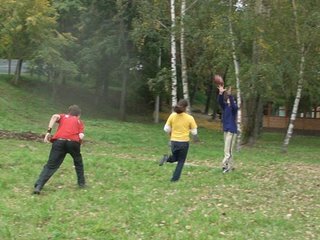 So, this is my team at the snap and here is Joanna's friend Vova (short for Vladimir) on the recieving end of a touchdown pass. This game is fun and easy, right? My team won our two games and, all-in-all, we had a great time. Also, don't forget to read Joanna's post on the subject. Yup, and this last one is us playing American football in the shadow of the Golden Gates...a fun juxtaposition, don't you think? 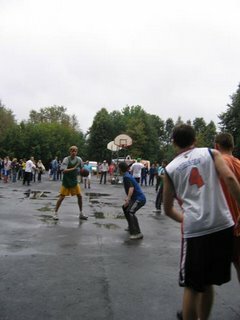 Here, as promised over a week ago, are some pictures of our adventures playing basketball in the middle of a rainy, cold, Russian autumn day. Actually these pictures turned out pretty well. I can't take credit (obviously, I'm in them.) They came from Alexei, our resident director/boss/photogropher/nice guy. There is not too much else to report. Yesterday's post was pretty comprehensive. The only other thing is that the weather this weekend is forecasted to be really nice again and so we might take a trip to Bogolubovo. Its an old villiage with a famous medieval church, which I hope to have some pics of by Monday. And you know what...he’s right. I have proof. 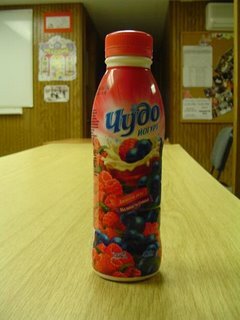 That's right, the greatest food in Russia; yogurt, with real fruit in it. And what did they name this tasty creation? Naturally, chudo (miracle). On other fronts, things are going great. The weather has been beautiful and much warmer this week. You could not ask for a nicer fall day than today, plus the forcast is for more of the same. Maybe Nina Petrovna was right when she said that we would have a great fall. Classes are going pretty well, but I am still struggling a bit with my "silent-as-death class." They are all between the a ges of about 13-16 and, with the exception of two fairly precocious girls, none of them like to talk in class. And lastly, on Saturday we are introducing the students to the joy of playing football. 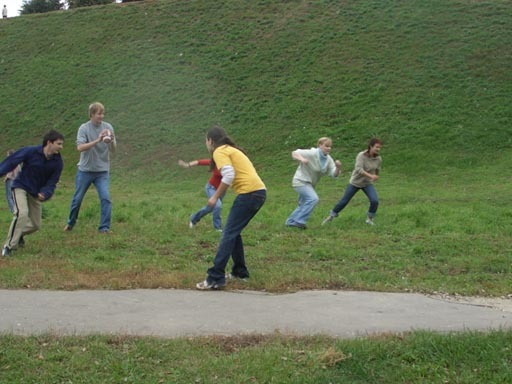 That's right, real-live "American football." This should be a treat! Yup...that about sums it up! 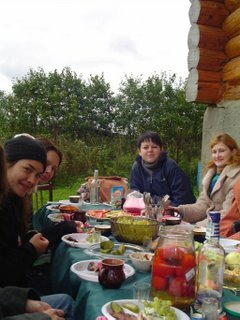 Today's trip to the dacha was a great success! It was cool, around fifty degrees, but the sun was out part of the time and we had plenty of warm clothes to keep us from becoming zamyorzli (frozen.) The dacha belongs to one of our Russian instructors and she and her family generously invited us to spend the day. They have a nice little summer house, a place to build a fire, a garden, basketball hoop, and they are in the process of building a private banya or bath-house. 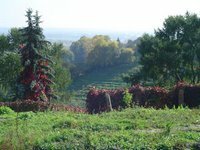 This paradise is located about an hours' drive from Vladimir, but not that far as the crow flies. It is in a small villiage that was once large, but is now only occupied by people with summer homes. This is a picture of the church that was built in the 18th century, but was neglected in during Soviet times. It is quite striking, the first thing you notice about the place. This is a picture of us standing outside the dacha as we are preparing to leave. Relaxed and rested, even though we spent a good part of the time playing games, eating, drinking tea, and all the rest. 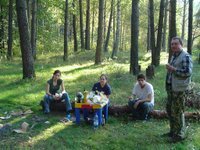 The best part of the day was the meal: as advertised, we had shashlik, plenty of vegetables, tea, snacks, cheese, bread, and all the rest. It was all in all a great day. 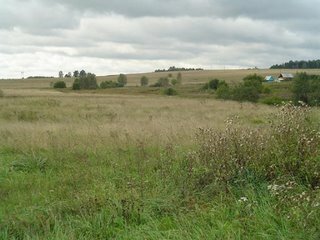 I thouroughly enjoyed the Russian countryside and the weather was, while cold, pleasant and certainly bearable. 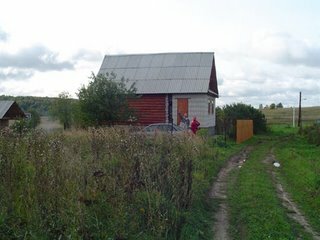 All in all, it was a great day: it makes me wish I had a dacha of my own. I'll include a few more pictures just for the fun of it...but also check out the other blogs for more fun and insight. The end of the first full week is upon us, let the celebration begin. As it is Sara's birthday and then end of the week, we are planning to visit what is apparently the city's best restaurant, which serves nominally Azerbaijani cuisine. The first time we went, it seemed a lot like the Georgian food I remembered from Petersburg, so maybe it is a more general Caucasus type of food. Flatbread, goats' milk cheese, delicious soups...all sorts of good things. On other fronts, we are finally going on our long planned picnic at the dacha, despite the forecast that calls for 48 and partly sunny. I suppose that my hat and gloves and extra layers of clothes might make their first appearance of the year. I will have some good pictures of shashlik and the Russian countryside to share soon. Yesterday, for the first time I tried out SKYPE , a voice-over-internet program. (Thanks Bob!) Check it out, I called my sis in New York City...from Vladimir...for free. I know this has been around for a while, but I am behind the times and it is new to me. 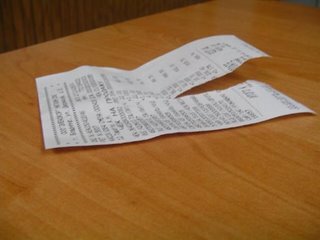 And lastly, can anyone give me a logical reason why every cashier in the entire country rips the corner of the receipt when she hands it to you? Today we have another day of classes. Things are settling into a routine pretty well around here. I definitely felt a lot more comfortable with my classes the second time around. I've had a couple of "Aw, jeez, what am I doing here?" moments, but for the most part I've felt pretty good about teaching. In other news, supposedly we havew begun babi leto, that is Indian Summer (the phrase literally means "grandmother's summer.") It is still cool, about 55-60 for the high, but it hasn't rained yet and the sun has shone more today than it has in the last week combined. We were actually able to go out in the yard and toss around a football for the first time in quite a while. If it holds out for the weekend, which the forcast is pointing to, we might get to take our long awaited trip to the dacha (summer house) for some shashliki (think shish-kabobs over an open fire.) I'm looking forward to it a bunch. This weekend was pretty uneventful. After surviving our first two days of class, we were ready. 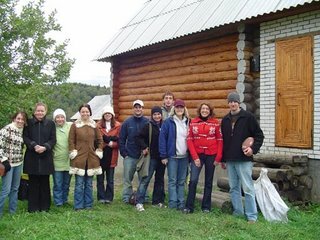 On Saturday, the group of American tourists came to visit us and talk about Russia, Vladimir, the American Home, and lots of other stuff. Afterward, we went to a jazz concert put on in honor of den' goroda, or City Day, a kind of festival celebration with people out roaming the main street and lots of games and entertainment for kids. The concert was very good, apparently the trevelling jazz orchestra is one of the best in Russia. 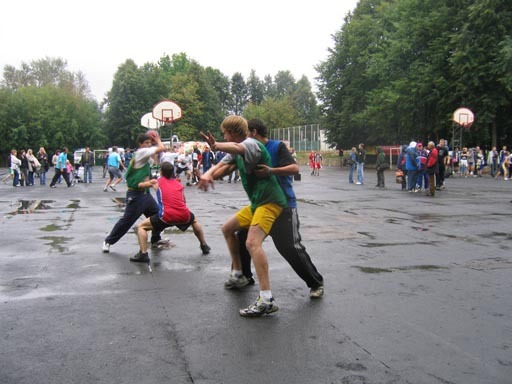 On Sunday, we woke up and discoevered that the weather was very cool and rainy, but we braved it because Eric and I had promised to participate in a "streetball" basketball tournament, held outdoors in the park, rain or shine. We had a Russian, Igor, as our third player. We won our first game very easily, drew a bye in the second round, and then lost in a close one in the third round. We had fun and got t-shirts as a prize. Alexei, our director, took some pictures that I will try to post sometime soon. This morning is cool and wet, about 50 degrees. We have also been getting calls from newpapers and other media asking for our recollections and impressions of 9/11, since we are the only Americans that they can find on such short notice. Well, we're back from Nizhni today and we had a great time. I really enjoyed the city. It is quite a bit bigger than Vladimir and kind of a bustling city. There is a lot going on, but it is not so huge and overwhelming as Moscow. We left on Saturday morning and took the three-hour train ride from Vladimir. When we got there, Joanna's friend, Joanna met us. She lives there and works as an assistant director of the study abroad program at one of the local universities, which Joanna studied in a couple of years ago. She was very gracious to show us around the city and to let us stay the night at her place. Saturday morning the weather turned from cool and cloudy to warm and sunny. We were treated to very nice weather Saturday afternoon and took advantage of it by walking around the city a little. One of the main streets that leads away from the 16th century Kremlin has been converted into a pedestrian street and is lined with shops, stores, cafes, and lots of other interesting stuff. 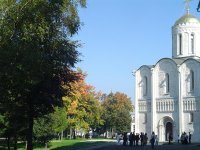 There are several monuments around the city, most of them to two guys named Kuzma Minin and Dmitry Pozharsky. 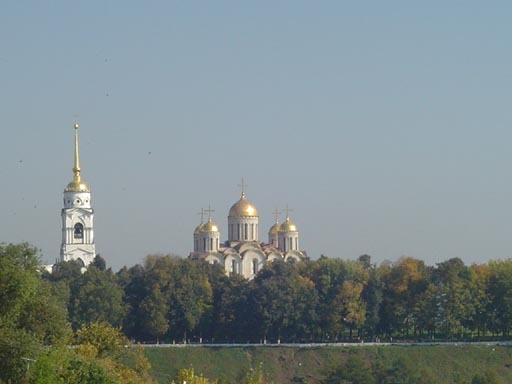 In the early 17th century, the gathered their forces in Nizhni and marched to Moscow to expel an invading army from the Polish-Lithuanian Commonwealth and then they set Mikhail Romanov on the throne, beginning the three hundred years of the Romanovs' rule. Nizhni was also a major trading center for tsarist Russia, being a center for the fur and grain trades that propped up the economy. 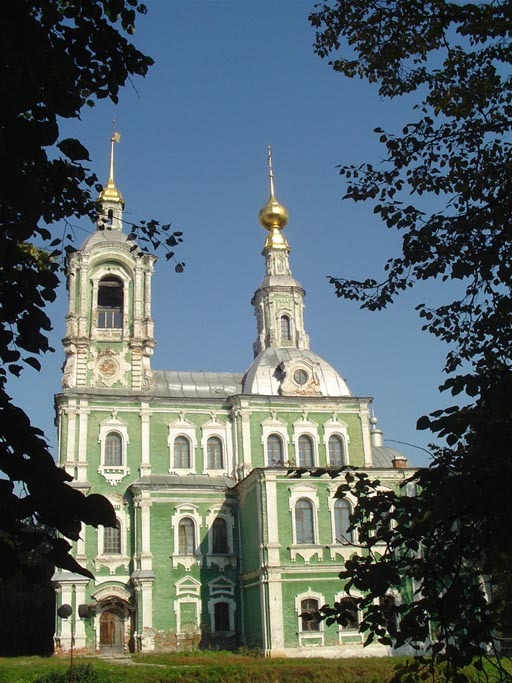 The Stroganov family that dominated the Siberian trade and became fabulously wealthy based themselves in the city. (Not to mention lending their names to a tasty dish.) In the 19th century, it was supposedly said that Petersburg was the country's head: Moscow, its heart; and Nizhni, its wallet. Saturday evening we made some dinner ourselves and then went out in search of a cafe or bar, which we eventually found after several unsuccessful trips. On Sunday it was rainy and cool in the morning so we stayed in. After noon we went out and took in a little more of the city, including a really cool cafe with book shelves everywhere and all kinds of eclectic furniture and stuff. I might also add that it had some really excellent blinni. After that it was pretty much time to head for the train station, but not before we stopped at the McDonald’s that is across the street. All in all, it was a really fun trip and I am glad that we went and had a great time. This week begins with a couple of days to spend preparing for classes, which begin on Thursday. I think we are all a little bit nervous, but I'm sure that it will work out fine. "Kak Oka?" "Kak shiroka nasha reka." Well, our last full week of prep is drawing to a close. By this time next week, things will be in full swing. I am really excited and a little nervous. 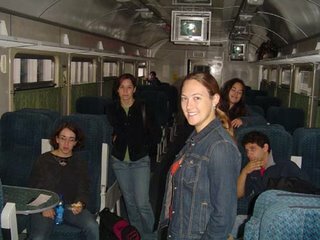 In other news, today, kind of on the spur of the moment, six of us (myself, Joanna, Eric, Sara, Nicole, and Molly) bought tickets to take the train to Nizhni Novgorod. Its about a three hour train ride. Its about as far from Vladimir as Moscow is, but in the opposite direction. Unlike some things in Russia, train tickets are cheap. We got first class tickets for the trip there that were about thirty rubles (a little more than a dollar) more than the second class and only cost us about eight bucks. We're leaving tomorrow morning and will be returning Sunday evening. Joanna's friend, Joanna, has graciously offered to let us sleep on her couch...and futon...and floor. Nizhni, known as Gorki after the Soviet writer and poet Maksim Gorki, is a sprawling industrial and historic trade city that sits at the confluence of the Oka and Volga Rivers. 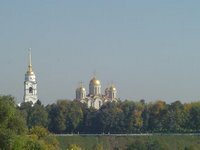 It is famous for its Kremlin and a couple of monastaries. It also has three McDonald's, which I have the sneaking suspicion that we will visit whether I like it or not...I guess I'll have to just buck up and like my McFlurry. I'm looking forward to the trip a bunch, as one of my goals was to see as much of Russia as possible. Hopefully I will have some fun stuff to tell about and a few pictures to post on Monday.